Just two decades ago, higher education in China was a rare privilege enjoyed by a small, urban elite. The government’s “Made in China 2025” strategy to become a global high-tech leader in industries such as advanced IT and robotics has created plenty of opportunities for graduates in these fields. Not only are the starting salaries high, but long-term earnings follow a starkly different trajectory. Three years after graduating, the top 15% of engineering, economics and science graduates earn more than double the median salary for other graduates. 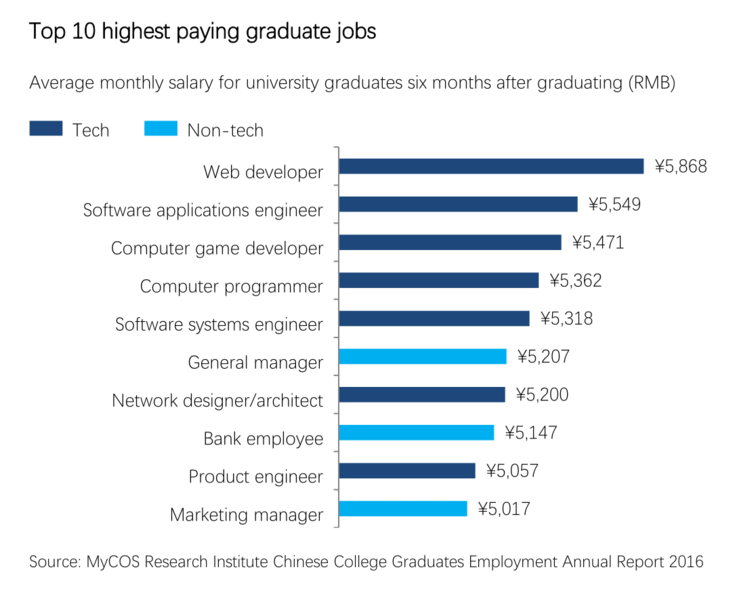 Despite the rapid increase in the number of university graduates, Chinese companies complain of not being able to find the high-skilled graduates they need. The main deficit is in so-called “soft skills” such as strong communication, analytical and managerial skills. According to research by McKinsey, there is a short supply of graduates with these assets. Chinese universities have a great track record of teaching students “hard skills”, but the test-focused education system has placed little emphasis on the development of anything else. So while graduates from technical or quantitative majors find employment because they have the necessary “hard skills”, graduates from less technical majors are hampered by their lack of both types of skills. It seems then that the problem is not the rising number of students attending university, but that there is a mismatch between the skill composition of graduates and the skills employers need. Demand for graduates with technical or quantitative skills has in fact risen faster than supply, resulting in attractive employment opportunities for graduates with these skills. But for the rest, their education leaves them badly prepared for the jobs that are available. Until this changes, the polarisation in the graduate job market is likely to continue.